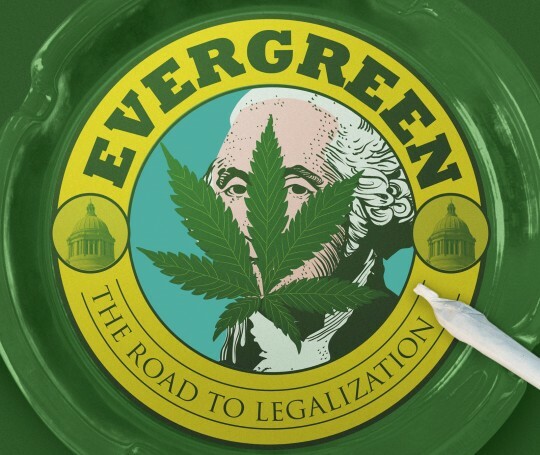 "Evergreen: The Road to Legalization in Washington" is an upcoming feature documentary film on the legalization of recreational marijuana in Washington State and the groundbreaking impact of this controversial decision on American drug policy. Feb. 7, 2013 - PRLog -- SEATTLE, Wash. - The producers of the upcoming independent documentary "Evergreen: The Road to Legalization in Washington" today released a new trailer for the film, which is in the final stages of post-production. "Evergreen: The Road to Legalization in Washington" is an in-depth examination of Initiative 502 and the future of drug prohibition laws. The film captures a landmark period in American history, taking viewers behind the scenes during the intense I-502 campaign while examining the context and controversies surrounding this unprecedented public vote to legalize, tax and regulate the recreational use of marijuana. The documentary will serve as a case study for citizens and lawmakers across the nation in working to reform drug policy at both the state and Federal levels. Director Riley Morton and producer Nils Cowan partnered with a Webby and Emmy® Award-winning team of local filmmakers to handle post-production and release. Jason Reid, Darren Lund and Adam Brown are the producers and editors behind the acclaimed feature documentaries "Sonicsgate: Requiem for a Team" (2012), "K2: Siren of the Himalayas" (2012) and "Man Zou: Beijing to Shanghai" (2010). A state in the upper-left corner of America is a key battleground in the fight for cannabis prohibition reform. A booming medical cannabis industry paved the way for cultural change in Washington State, and the architects of Initiative 502 put forth a plan they feel will balance the delicate politics of the region and stand a chance to pass in November. But many in the local community are vehemently opposed to I-502, saying it imposes harsh and scientifically arbitrary DUI laws, new taxes, additional restrictions and penalties that negatively impact medical marijuana patients and youth. Travel guru Rick Steves joins ACLU lawyer Alison Holcomb, Seattle City Attorney Pete Holmes, former U.S. Attorney John McKay and an unlikely alliance of politicians in pushing support for I-502 forward. Medical marijuana activist Steve Sarich and local defense attorney Doug Hiatt are the leading voices of the movement opposing I-502. An intense political campaign season is rife with conflict at I-502 rallies and events, climaxing in a heated showdown at the State Capitol in Olympia. Featuring exclusive interviews and behind the scenes footage with insight from the reporters, activists, patients, dealers, business owners, citizens and industry insiders who lived this story. Riley Morton (Director / Producer) has produced documentaries and television for a variety of clients on five continents over the last 15 years. He directed the feature mountaineering documentary "Found on Everest" (2001), and and his camerawork been seen on PBS, NBC, Discovery, National Geographic Channel, ITN and CBS along with dozens of digital channels. Nils Cowan (Writer / Producer) is a Seattle filmmaker with 13 years of experience producing, directing and writing story-driven content for television, theater, web and multimedia. After 10 years working as a staff producer and freelancer in Washington, D.C, Nils came back west to Seattle. He has produced award-winning documentary films for Discovery, National Geographic, PBS, Travel Channel and The National Park Service. His most recent film, "Into Deepest Space" (2012), is currently airing on PBS. Siren of the Himalayas" (2012) and "Man Zou: Beijing to Shanghai" (2012).